Water removes heat from metal surfaces about 15 times more rapidly than air. Therefore, water cooled condensers are much smaller than air cooled condensers. A common problem with water cooled condensers, however, is formation of deposits from water on the tubing walls. These scale deposits act as an insulating layer, causing lack of proper heat transfer for condensing of refrigerant. This causes high refrigerant discharge pressures and loss of refrigeration capacity. When condenser tubes have hard lime or iron scale they may be cleaned with an acid solution. The procedure is as sketched as below. Caution: always wear goggles and rubber gloves when using an acid solution. 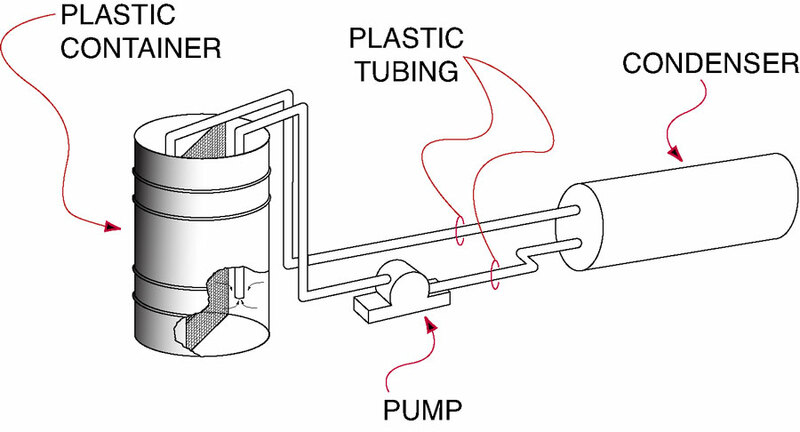 The pump must be designed for acid solutions (see figure 2). Use of plastic pipe or tubing is recommended. Warm solutions will work best, but do not heat above a warm temperature. Mix warm water and acid according to container instructions (usually 10 parts water to one part acid). Circulate acid mixture through condenser for 15-30 minutes. Remember acid is corrosive so do not circulate longer than 1 hour. A ‘tee’ fitting could be installed in the inlet and outlet of the condenser water circuit for future condenser cleaning. For more information about Cleaning Water-Cooled Condenser call the Advantage Service Department at 317-887-0729. Would you like to Download FYI #184 to your browser?